Lyme Disease is a bacterial infection caused by spirochete bacteria known as Borrelia burgdorferi. Because Lyme Disease is relatively new in dogs, there are still some facts experts are unsure about, including how to interpret test results and how to treat the affected dogs. According to the CDC, Lyme disease is the most commonly reported vector-borne disease in the United States. Also, there has been a trend of increasing incidence in endemic areas as well as geographic spread to new areas over the last few years. Lyme Disease can affect any mammal species. 2) What symptoms will the dog exhibit? When Borrelia burgdorferi organisms enter the mammalian host via a tick bite, the spirochetes initiate an infection that develops slowly over weeks and months. Periods with no obvious illness alternate with periods during which the patient shows mild to severe clinical signs. During this same time, the organisms establish a persistent infection that the immune system is unable to eliminate. As a result, the veterinarian is often confronted with two canine patient populations. The “classic” Lyme disease patient presents with mild to severe signs of the disease. On the other hand, many apparently healthy and asymptomatic animals are brought in for other reasons and the infections are discovered accidentally when the veterinarian screens for possible infections. It is reasonable to wonder if an individual dog’s stoicism may effectively mask the clinical signs brought on by Lyme disease, particularly in breeds of dogs known for stoicism, (i.e. the Kerry Blue Terrier). Clinical signs develop in only about ten percent of infected dogs, meaning a dog can test positive for Lyme and remain asymptomatic! When they do occur (usually two to five months after the tick bite), the most common documented symptom is lameness (due to polyarthritis, followed by enlarged lymph nodes (lymphadenopathy), anorexia, lethargy and fever. Less common syndromes associated with Lyme disease include renal disease (Lyme nephritis), heart disease (myocarditis) and neurological disease. Since our dogs cannot verbally describe their symptoms, it is not known whether or not dogs get the devastating recurrent disease syndromes typical of humans infected with Lyme. Statistically, roughly ninety percent of cases of canine patients with Lyme disease present to the veterinarian with signs of limping (usually only one leg), accompanied by lymph node swelling in the affected limb and temperature of 103 degrees. Under experimental conditions, dogs become intermittently lame due to a severe inflammatory response in the synovial membrane of the joint closest to the tick bite. The limping usually progresses over three to four days from mild to complete disuse of the painful leg. Once the bacteria has spread in the dog’s body, it can progress within two to three days from mild discomfort in one limb to the point where the dog is in such muscle and joint pain it will refuse to move. It is important to note that the “bull’s eye” rash or erythema migrans, which is typical in the human patient is not commonly found in canine patients. Also important to note is that prompt diagnosis and treatment with antibiotics can cure the dog before permanent joint or nerve damage occurs. Lyme disease should always be suspected when a dog ran or played normally a few days ago, has had no trauma or previous arthritic symptoms and suddenly displays lameness with swollen lymph nodes. However, just as in human medicine, Lyme disease is called “The Great Imitator” because it has often been mistakenly diagnosed when another disorder is present, such as an autoimmune disease, lymph tissue cancer, Blastomycosis or septicemia. Therefore, it is imperative that the vet rule out other possible causes of the dog’s symptoms while continuing to consider Lyme as the possible culprit. 3)How prevalent is Lyme Disease in dogs? Lyme Disease has been reported in forty-eight states with the Northeastern and Midwestern states accounting for the majority of cases. Only ten percent of dogs infected with Lyme Borrelia burgdorferi develop clinical signs of disease. Up to seventy percent of dogs that live in the northeastern and midwestern states in the U.S. have serum antibodies to Lyme Disease. Statistically, fifty percent of dogs in the northeast and Midwest are infected annually. 4) How do dogs get Lyme Disease? Dogs are infected with Borrelia burgdorferi bacterium when bitten by an infected tick. At least three known species of ticks can transmit Lyme Disease. However, the most common one responsible for transmitting the disease is the Ixodes Scapularis tick, commonly known as the Black-Legged or Deer tick. 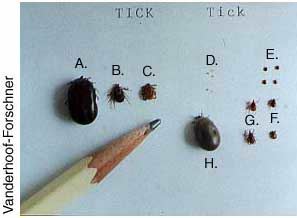 These ticks are much smaller than the common dog tick-about the size of a poppy seed. The picture below demonstrates the size differences between the Deer tick and the common dog tick, with a pencil used for size comparison. Not all Black-Legged ticks harbor these bacteria. In areas of the northeastern and midwestern states, where Lyme disease is most prevalent, only twenty-five to fifty percent of ticks were infected with Borrelia burgdorferi. However, since the only way to be sure which ticks are infected is to have them analyzed in a lab, the safest thing is to consider all ticks as potentially infected. At the time of the tick bite, the spirochete bacteria reside in the tick’s gut. Stimulated by the blood meal, the spirochetes begin to migrate to the tick’s salivary glands. The bacteria are then injected into the dog with the saliva from the tick as it feeds on the dog’s blood. Studies have shown that it takes twelve to twenty-four hours for the organisms to transfer from the tick’s mid -gut to the host. If the tick is removed before it has been attached for that long, it cannot transmit the bacteria to the dog. 5) How is Lyme disease diagnosed? With the recent advance of a reliable in-hospital test kit, the popular “blue-dot” or “snap” test offers results quickly and inexpensively. The SNAP 3DX test (IDEXX laboratories, Portland, ME) for example, detects antibodies within 35 days of tick exposure and remains elevated for an additional 530 days. This test is reported to have a sensitivity of 92% and a specificity of 100%. This test shows infection but does not verify disease. The definitive way to diagnose infections is through culture of the bacteria, usually via skin biopsy samples taken close to the site of tick attachment. Spirochetal organisms are rarely detected in blood samples. Polymerase chain reaction (PCR) testing has been found to be more specific and less labor intensive than culturing of tissue samples. However, negative PCR results do not exclude an infection because the very few DNA copies of the organisms are often not numerous enough to be detected in all samples. 6) How is Lyme disease treated? Antibiotics such as the tetracyclines, penicillins and macrolides are very effective in improving the clinical symptoms for the patient but usually fail to totally eliminate the infection. Antibiotics must be given for four weeks. Corticosteroids (i.e. prednisone) should be used only cautiously and always in combination with antibiotics. 7) How can Lyme disease be prevented? Lyme disease can be prevented by the elimination of ticks from the environment, removing ticks from the dog within twelve to twenty-four hours of attachment, by using chemicals on the dog to repel or kill the ticks when they try to attach or by vaccination. 8) How can ticks be eliminated from the environment? To answer this question, one must understand the life cycle of the tick. The tick’s life cycle includes four stages; the egg, larvae, nymph and the adult. This life cycle requires two years to complete. Adult ticks lay their eggs in late summer or early fall, typically depositing them in a heavy layer of leaves or other mulch. Larval ticks hatch in early spring and attach themselves onto tiny rodents, typically the vole or white-footed mouse (which also tends to live in the heavily mulched areas). The larval ticks ingest the Borrelia burgdorferi bacteria while feeding on these tiny rodents, who harbor the bacteria in their bodies. In late spring, the larvae mature into the six-legged nymph ticks. It is during this stage of the tick’s life (usually May through August) that it is most likely to transmit the bacteria to any available mammal, including the dog. It is important to note that at this stage, the nymphal tick is much smaller than the head of a straight pin, so is very hard to see with the naked eye. Since the tick’s presence on the dog and even its bite cause no pain or itching, it often remains attached there, undetected, long enough to complete its blood-meal before it drops off days later to mature into the next stage. In summer, the nymphal tick matures into the adult, which will lay its eggs later in the summer, starting the cycle all over again. So, to eliminate the ticks, we must first eliminate the small rodents they feed on. This can be accomplished by clearing out all mulch in the late summer and early fall. This would break the life cycle at the larval stage, thus preventing the ticks from establishing themselves on your property. To break the cycle at the nymph and/or adult stage, there are safe and effective insecticides that can be used in the dog’s usual environment. In addition, there are several chemicals that can be used on the dogs to kill or repel the ticks before they get the chance to inject the bacteria into the dog. It is important to note that these agents will kill the tick only after it is on the dog. The longer the tick is attached and biting, the greater the risk of transmission of bacteria IF the tick is actually harboring the bacteria in its gut. Also, no repellent can be expected to keep every single tick off a dog! One word of caution; more is not always better…if you’re using a topical spot-on treatment, check with your veterinarian before also applying a spray, dip, shampoo or collar. Frontline Plus is available as a liquid spot-on application or as a spray .It is applied to the dog’s skin and spreads through the skin’s oil layer. K9Advantix is another prescription anti-tick medication that also repels mosquitoes and fleas. Sprays, shampoos, collars, powders and dips are often also used (in these ingredients, it seems that permethrin is more effective than pyrethrin). Some vets feel that tick collars containing the product Amitraz work well. For more information on pesticides, check with the Environmental Protection Agency (www.epa.gov). 9) How can the tick population be kept to a minimum on the dog without the use of pesticides? Examine the dog after any outdoor excursions and carefully pick off any ticks you find, using small tweezers to grasp the tick as close to the dog’s skin as possible and gently pull away from the skin. Be careful not to crush the tick. After removal, cleanse the skin with antiseptic. Avoid fields of high grass and weeds as much as possible, especially during late spring through early fall while the ticks are searching for their blood meals. Remember that it takes the bacteria twelve to twenty-four hours to migrate from the tick’s gut to its saliva and into the dog. Any tick removed before it’s been attached for that length of time cannot infect your dog, even if it is carrying the Borrelia burgdorferi bacteria! Currently, two types of vaccines are available to veterinarians. Both types of vaccine produce antibodies that attack the bacteria in the tick and block its transmission to the dog. The first group of vaccines is more accurately called “bacterins”. Bacterins are produced from bacteria grown in cultures that are then chemically or physically inactivated. The second group of vaccines available relies on recombinant OspA. (OspA stands for “outer surface protein A) This is a lipoprotein expressed by the bacteria when the tick is feeding on a mammal. When the vaccine-initiated antibodies to the OspA are produced by the dog, these antibodies bind to the surface of the bacteria in the gut of the tick, thus preventing the bacteria from migrating to the saliva glands of the tick. Therefore, the bacteria are “stuck” in the gut of the tick and cannot infect the dog. Unfortunately, antibody levels of both vaccines tend to peak shortly and drop off during the following months, so yearly vaccination for Lyme disease is recommended by many vets in endemic areas of the country. As with all vaccine types, antibody production is dependent on the individual’s immune system’s ability to launch a response to the antigens.